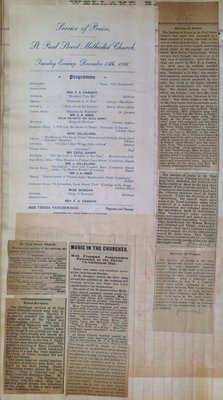 Page 48 of the first of Teresa Vanderburgh's Musical scrapbooks - program for a service of praise at St. Paul Street Methodist Church as well as newspaper clippings about various performances at churches in St. Catharines. One article is partially folded at the bottom. For the full article see Scrapbook # 1 - Page 48 - Article 1. Churches mentioned are St. Paul Street Methodist, St. George's, Welland Avenue Methodist, Knox Church, St. Catherine's Church, St. Thomas and St. Barnabas. Location: Scrapbook # 1 - Page 48.